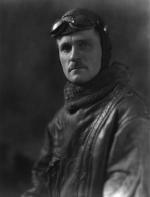 Major Carl A. Spaatz, circa 1918. Carl Spaatz was a Pennsylvania Dutchman from Berks County. His father was a Democratic state senator who helped his son gain admittance to West Point, from which he graduated in 1914 as an infantry officer. Interested in the new technology of airplanes, Spaatz transferred to the fledging Air Service of the Signal Corps, taking part in the Mexican border operations against Pancho Villa. When America entered the First World War, Spaatz, by then a major, was sent to Europe to train other troops. 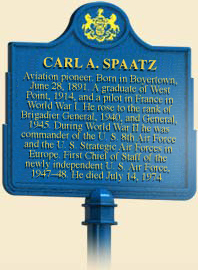 Disgusted with his assignment, Spaatz went on leave from the U.S. Army and joined a British flying unit. In a single action Spaatz downed two German planes, then barely had enough gas to make it back to a landing in friendly territory. The British awarded him a Distinguished Service Cross for this action, but Spaatz's original orders still stood and he was soon back in the American army training pilots. When the army experienced major cut-backs in funding and manpower after the war, Spaatz became an ardent supporter of General Billy Mitchell, whose rash defense of air power earned him a court martial in 1925. Air power became a bit more popular after Charles Lindbergh flew solo across the Atlantic in 1927, leading the military proponents of air power, including Spaatz, to undertake circus-like feats to appeal to the public. In January 1929, he and two comrades remained airborne for a record 151 hours. Along the way, Spaatz became good friends with General Henry H. "Hap" Arnold, who in 1940 sent Spaatz to England for four months to report on the situation there. After American entry into the world war, Spaatz took charge of the Materiel Division of the Army Air Forces, and after promotion to Major General took command of the Army Air Force Combat Command, and was tasked with preparing it for operations in the European Theater of Operations. Renamed the 8th Air Force, the group began moving planes, men, and equipment to England in preparation for offensive air operations. Major General Carl A. Spaatz, circa 1945. Spaatz's planes included the B-17 Flying Fortress, which would become one of the major American bombers of the war, soon followed by groups of B-24 Liberator bombers. Both were heavily armed with machine guns to defend against German fighters. Spaatz sent out his first combat mission on July 4, 1942, then followed with independent bombing missions beginning in August. Later that fall, Spaatz took command of the Allied air forces engaged in Operation Torch, the invasion of North Africa. As American involvement in the European war increased, "Hap" Arnold then promoted Spaatz to lieutenant general and placed him in charge of the new United States Strategic Air Force, a position that would place Spaatz in command of most of the American air effort in Europe. General Jimmy Doolittle, the hero whose planes had bombed Tokyo back in May 1942, took command of the Eighth Air Force. Spaatz's assignment also brought him in control of the Fifteenth Air Force, with some say in operations of the 9th Air Force, created to provide direct air support of the projected invasion of France. Spaatz thus directed the largest concentration of air power in military history. While the British Royal Air Force preferred to bomb their targets by night, the Americans sent large bomber forces to seek their targets by day. Spaatz, despite his gruff and oftentimes grim manner, got along well with his British counterpart, Arthur "Bomber" Harris. Prior to the war, a military-planning group had figured that Germany contained 154 vital targets, which if destroyed would severely limit the Nazi's ability to wage war. At the time, the British conducted area bombing. Spaatz instructed his bombers to conduct precision bombing, using the superior Norden bombsight that all American bombers carried, against vital German transportation points and oil facilities. Bradley and Spaatz visit, June 4, 1945, Philadelphia Returning Heroes Parade. The Eighth Air Force suffered heavy losses until early in 1944, when P-51 Mustang fighters joined the bombers as escorts. American planners had estimated that perhaps 6,800 bombers could knock Germany out of the war in six months. Requirements in the Pacific and the Mediterranean, however, prevented American bombing strength from ever approaching that figure. And though Spaatz argued for more bombers to bring Germany to her knees rather than risk an invasion with heavy casualties, in the end, a combination of air and ground power defeated Germany. In June 1945, Spaatz was reassigned to command the American bombing offensive against Japan. In this capacity, he was in charge of the destructive firebombing raids on Tokyo and other major cities, as well as the employment of the atomic bombs on Hiroshima and Nagasaki. After the war, when "Hap" Arnold retired as head of the Army Air Force, Spaatz became his successor, and in 1947 became the first chief of staff of the new U.S. Air Force. After his retirement in 1948, Spaatz worked as a correspondent for Newsweek, and chairman of the Civil Air Patrol. He also assisted in choosing Colorado Springs as the site for the new Air Force Academy. 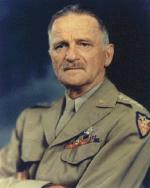 General Spaatz died in 1974. David R. Mets, Master of Airpower: General Carl A. Spaatz (Novato, CA: Presidio Press), 1997. Robin Neillands, The Bomber War: The Allied Air Offensive Against Nazi Germany (Woodstock, NY: The Overlook Press), 2001.